The Pittsburgh Penguins have claimed forward Jean-Sebastien Dea off waivers from the New Jersey Devils, it was announced today by executive vice president and general manager Jim Rutherford. Dea has been assigned to the Wilkes-Barre/Scranton Penguins of the American Hockey League. Dea was claimed off waivers by New Jersey from Pittsburgh on September 28, 2018. The 24 year old appeared in 20 games with the Devils this season and registered three goals and two assists. During the 2016-17 and ’17-18 seasons, Dea saw action in six NHL games for the Penguins and recorded one goal, the game-winning goal, on January 23, 2018 against the Carolina Hurricanes. 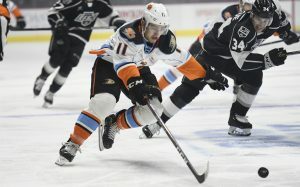 He skated as a member of the Penguins’ Black Aces playoff practice squad during their back-to-back championship runs in 2016 and ’17. 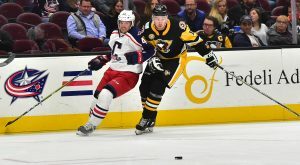 The 5-foot-11, 175-pound forward spent the previous four seasons in the Pittsburgh organization since being signed as an undrafted free agent in 2013. At the AHL level, Dea has compiled 141 points (66G-75A) in 262 career games. He established career highs for assists (32) and points (50) during the 2017-18 season and has scored at least 15 goals in 3 of his four full seasons with WBS. Dea was named the WBS Penguins’ team MVP during his career year in ’17-18.